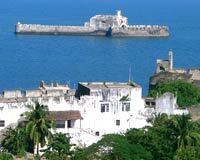 Daman earlier called 'Damao', is situated on the west coast of India, bordered by the Arabian Sea. It is surrounded by the Kolak River on the north, Gujarat on the east, Kalai River on the south and Gulf of Cambay on the west. 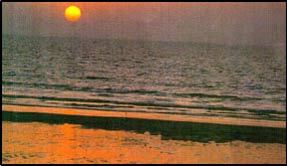 The clean and picturesque beached of Daman are very inviting to all the tourists especially the ever tensed and tired urbanites. Altitude : 12 meters, Climate : (deg C)- Summer- Max 36, Min 20; Winter- Max 26, Min 20, Best Season : October to May. By Rail: Nearest railhead is Vapi– 12kms. By Road: Bombay- 93 kms, Ahmedabad- 67 kms, Diu- 763 kms, Panaji via Bombay- 87 kms. Area: 38.5 sq.km, Altitude : 29 meters, Climate : (deg C)- Summer- Min 20, Max 38; Winter- Min 20, Max 25, Rainfall: 70cms, Best Season : October to May. By Rail: Nearest railhead is Delwada-9 kms. By Road: Una- 30 kms, Ahmedabad- 495 kms, Bhavnagar- 225 kms, Bombay- 930 kms, Daman- 763 kms, Sasangir-128 kms, Rajkot- 261 kms, Somnath- 87 kms, Veraval- 77 kms.